Manufacturer of a wide range of products which include aluminum plug type spindle, aluminum plug type twisting spindle, aluminum plug type spindle for manual doffing, aluminum plug type spindle for auto doffing, rabbeth (bare blade) type spindle and aluminum plug type textiles spindle. Since the establishment of our company, we manufacture and export the premium quality of Aluminum Plug Type Spindle. Ideal of textile industry, the offered aluminum plug type spindle is known for its ease of operation and consistent performance. 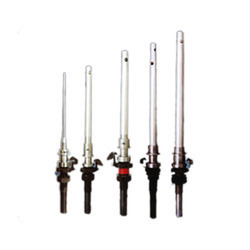 As a quality focused name, we assure that the quality of aluminum plug type spindle is maintained always at our end. Prices depends on the requirement of the products. We manufacture and supply the best quality of Aluminum Plug Type Twisting Spindle. Known for its high performance, corrosion resistance finish, durability and user-friendly operation, the aluminum plug type twisting spindle is highly demanded in textile and garment manufacturing industry. 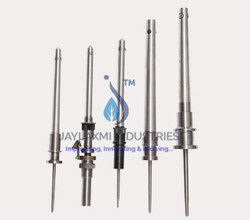 Our clients can avail the aluminum plug type twisting spindle in various specifications. Spindle‘s wharves diameter 18.5 to 22 mm. Supplies complete set with flange, nut, and spindle lock. We supplied spindle with specified insert as Texpart, SKF (teraspin ) , Novibra , Jaylaxmi . 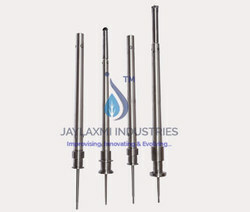 Jaylaxmi reduce vibration up to 0.05 mm/sec. For longer high precision Operating. High speed up-to 22,000 rpm. Each Stage Quality Checks to ensure exquisite quality system maintenance for superior performance. Reiter, L.R (LMW) LR6, LR8, LR9, LR7 machines, Texaco, KTTM, MMC, Mazroli, Zinser, Textool, suessen etc. we supplied spindle with specified insert as texpart, skf, teraspin , novibra , jaylaxmi . Each and every spindle dynamically balanced. Spindle‘s wharves diameter 18.5 to 22mm. 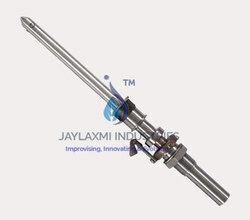 We supplied spindle with specified insert as, Texpart , SKF( Teraspin) , Novibra , Jaylaxmi . High speed up-to up to 12000 rpm. 6 Stage Quality Checks to ensure exquisite quality system maintenance for superior performance.